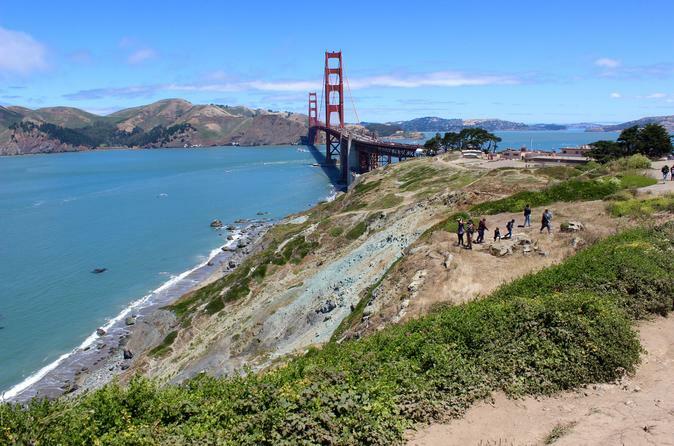 Enter a new world as you embark on an urban hike through the historic Presidio in San Francisco. Following your expert guide, wander through groves of pine, cypress and eucalyptus trees as you explore the highlights of this historic park and former military post. Your 3-hour, 5-mile tour starts in the Presidio Main Post, the central hub of activity for this former Spanish, Mexican, and American military base. You'll explore the Main Post, visiting the Presidio Officers Club as well as two Andy Goldsworthy artworks. From the Main Post, you'll pick up the Ecology Trail and climb to Inspiration Point where you'll take in views of the San Francisco Bay and the Palace of Fine Arts. On your way there, you'll visit a tranquil redwood grove. Continue past Inspiration Point and pick up The Bay Area Ridge Trail. You'll take this peaceful trail through eucalyptus and cypress groves, stopping on your way to check out a 100-foot-tall Andy Goldsworthy artwork. Next, you'll reach a highlight of this tour— the San Francisco National Cemetery Overlook— where you'll see the city's military cemetery with a stunning and poignant view of the Golden Gate Bridge behind it in the distance. From here, you'll leave the forests of the Bay Area Ridge Trail to reach oceanside trails and views. From here, you'll get nonstop views of the Golden Gate Bridge as you approach it along stunning coastal cliffs. Arrive at the Golden Gate Bridge and start your return trip. On your way back to the Main Post, you'll pass by the Crissy Field Overlook, the old Cavalry Stables, and the southern entrance of the San Francisco National Cemetery.